Last August, Best Buddies International launched its inaugural Gala in the Hamptons with a spectacular event at the home of Anne Hearst and Jay McInerney. Guests came from far and wide to support Best Buddies, a 501(c)(3) that enhances the lives of people with intellectual disabilities by providing one-to-one friendships and integrated employment. This year, Tatiana and Campion Platt will once again join Anne Hearst and Jay McInerney as chairs of the Gala. 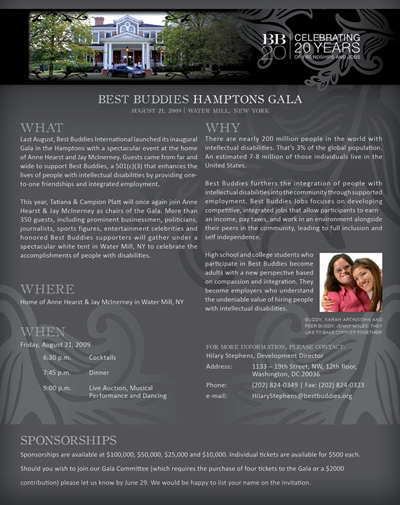 More than 350 guests, including prominent businessmen, politicians, journalists, sports figures, entertainment celebrities and honored Best Buddies supporters will gather under a spectacular white tent in Water Mill, NY to celebrate the accomplishments of people with disabilities. Sponsorships are available at $100,000, $50,000, $25,000 and $10,000. Individual tickets are available for $500 each. Should you wish to join our Gala Committee (which requires the purchase of four tickets to the Gala or a $2,000 contribution) please let us know by June 29. We would be happy to list your name on the invitation.